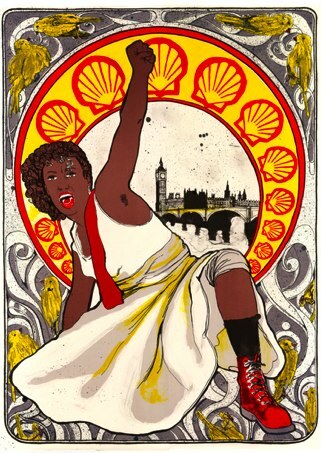 Rather than being about a specific protest movement or person, this post – the last of our Revolting Women series – is going to look at how campaigners in the UK and USA have used iconography based around the idea of feminist “patroness” figures to inspire protest. I want to think about icons, and how activists use them, particularly how protest movements – satirically or seriously – “borrow” figures from previous eras – art, history, legend – and recast them for current ends. On the one hand, as a post on the F-Word nearly a year ago outlined with feeling, this can create frustration, particularly around the idea of setting up individual “heroes” – even when they are rooted in metaphor – within a protest dynamic, which will usually derive much of its force from sheer collective whump. On the other hand, like any exercise in comparing bits of art, looking at the feminist movement’s choices of icons and allegories paints an invigorating kind of conversation down the centuries. Let’s start with Joan of Arc, resurrected forcefully by the suffragettes in the early 20th century to grace more than a few posters … and an impressive spate of parades. This is Elsie Howey in April 1909 – the month Joan of Arc was beatified by the Catholic Church – preparing to ride a white charger through the streets of London in armour as part of a parade to celebrate noted suffragette Emmeline Pethwick-Lawrence’s release from prison. Two years later, in June 1911, Marjorie Annan Bryce (seriously, you have to see this next pic) led WSPU members through London the same way as part of a procession organised a week before George V’s coronation. (The horse was led by a young woman dressed as Robin Hood.) 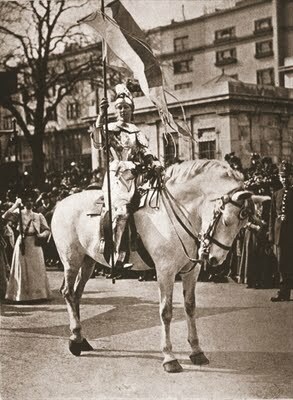 The Women’s Coronation Procession was one of the largest WSPU demos, and it marched with Joan of Arc at its head. Three years later, in Baltimore, Ida Baker Neepier also climbed onto a horse whilst clad in armour. Earlier that same year, English Jesuit Father Bernard Vaughan had expressed his consternation in a speech that the suffragettes wanted “to make Joan of Arc one of [their] patronesses”. Joan – canonised in 1920 – was a central icon for the women’s suffrage movement in Europe and North America. 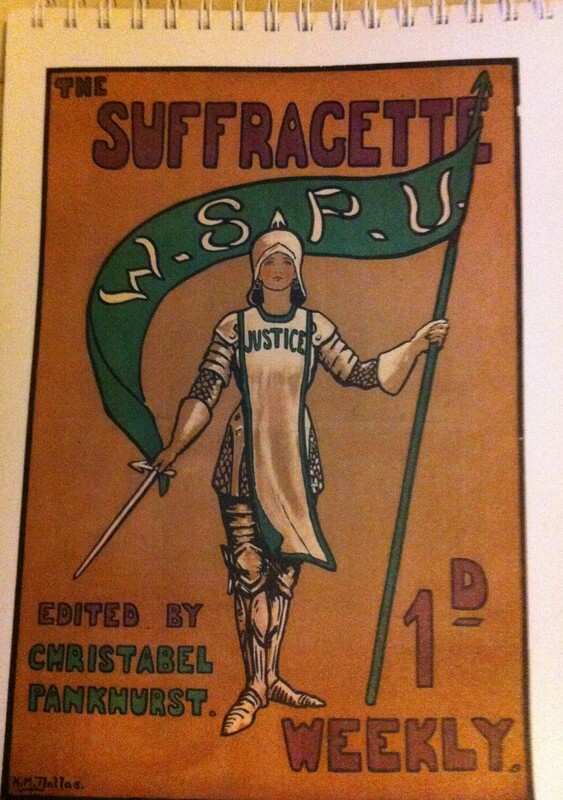 The WSPU in particular, with its emphasis on militant tactics, were especially enamoured of her, and Hilda Dallas designed a poster featuring her, wearing a tabard emblazoned with the word JUSTICE, to promote their magazine. Joan was a perfect fit for the suffragettes, personifying militant force and virtue simultaneously. For context, Victorian literary culture allowed plenty room for female heroism of a certain kind; for example, Grace Darling was idolised. But the demands of heroism, when they force the heroine of a Victorian novel out of the domestic sphere, often spring from a moral imperative (the heroine of Wilkie Collins’s The Law And The Lady, for example, defies the men around her to save her man from himself). Adopting Joan as patroness – a woman who had abandoned domesticity for battlefields only to act on imperatives sent to her in divine visions – gave the suffragettes’ cause similarly pressing moral overtones. Joan herself was something of a hot topic at the time; Sara Bernhardt had appeared as her on stage in 1898 and publically endorsed women’s suffrage after the Joan of Arc Suffrage League welcomed her to the US in 1910. The tragic events of the 1913 Derby saw Emily Davison cast as a literal Joan in WSPU eulogies; they were quick to capitalise on the acquisition of a contemporary martyr-narrative to go with historical ones. In the US, when Inez Milholland, who famously asked the President how long women should wait for Liberty, died of pneumonia in 1916, she was directly represented as Joan by artists. We still can’t get enough of her. Clasped to the bosom of the women’s lib movement in the 1970s, Rosie’s been a staple on flyers, books and posters ever since. The woman from the We Can Do It! 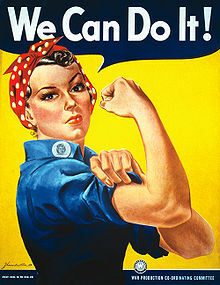 poster – known colloquially as Rosie the Riveter, although she was not, unlike Norman Rockwell’s poster, which was far more widely circulated, ever officially given that title – has, like Joan in the 1900s, been embraced by feminist campaigners as a a key visual figure. 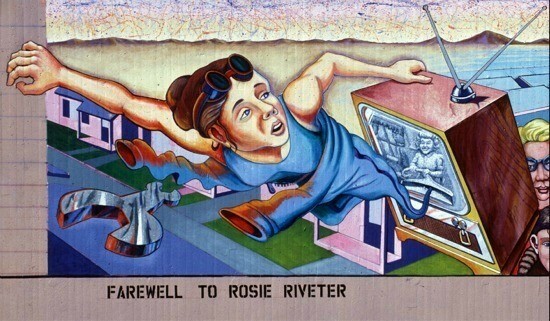 Minimally circulated in the war itself, rediscovered as the women’s movement gathered speed, “Rosie” is arguably as famous in her capacity as a feminist pop culture icon as a piece of WW2 propaganda; having borrowed her, we can’t stop remixing her, making her more bluntly feminist, more cheekily self-aware, undercutting the patriotic feeling of the original, or just because, from under a pile of retrokitsch retouches, she gives many of us a more direct sense of legacy than Joan. Although many feminists claim emotional kinship with the suffrage movement, it is Rosie that they totemically hold on to. Fridge magnets, wall clocks and coasters, many replacing “We Can Do It!” with “Feminism!” populate Cafepress in mushroom clouds of pouting and elbow-baring with a regularity that is by turns reassuring – look how far we’ve come – and galvanising – and we’re not done yet – but also carries a ring of predictability, mainly because I often find myself hoping we’re all still considering which “we” we’re talking about who “can do it”. Rosie’s enduring popularity with feminists is good-ironic or hmm-ironic depending how you look at it. 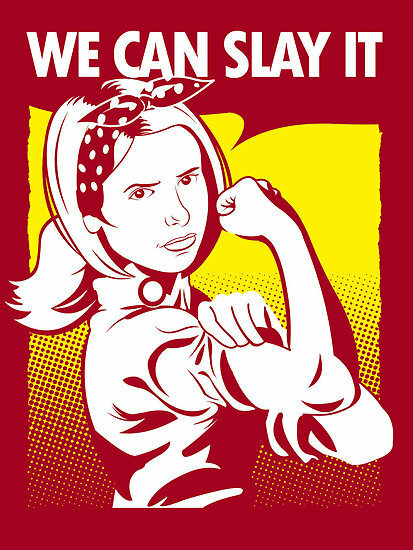 Sociological Images produced an excellent article earlier this year, Myth-Making and the ‘We Can Do It!’ Poster which ably demonstrates her limitations as a feminist icon, particularly in terms of her original status as a possible anti-trade union figurehead – we can do it (if you guys don’t ever strike, so better not!). On the other hand, the persistence and force with which feminists have held fast to Rosie has created a new cultural space in which she exists beyond WWII as a feminist symbol in her own right – we discovered just how often she appears on Google for “feminism” in this post. There’re many images are out there of real-life Rosies, who often aren’t as primped, glamorous or white. To your right is one such worker in 1943; many women (and men) of colour who did not feature on the war’s posters at all, played a crucial role in winning it. The many Rosie remakes on the market, all of which are uniformly white, have so far not engaged this issue. The more amusing ones include Buffy going retro and Princess Leia following suit. Meanwhile, celebrities including Pink have posed as Rosie. And on the explicitly feminist media front, the cover image of Cath Redfern and Kristin Aune’s Reclaiming The F-Word also references her with a knowing wink. The inference is clear – the reminder that after the war, women went, in droves, back to homemaking. 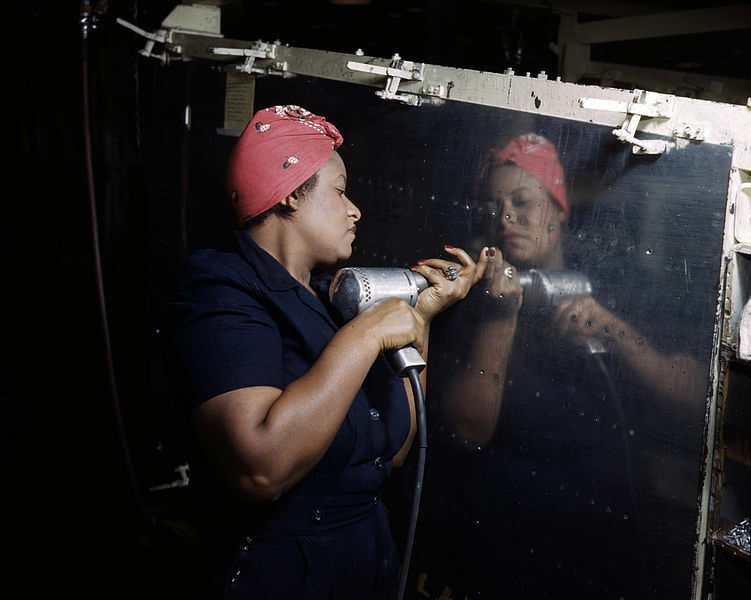 And it’s this that partly sits behind Rosie’s continued resonance; the War is still such a milestone, representing simultaneously the power of a female workforce and the limitations placed upon it. The suffragettes themselves, who once dressed up as Joan of Arc and declared her their cultural totem for the age, are now totemic in their own right. The women who held a woman who died in the 14th century up as their patroness have now inherited their own set of legendary laurels. What do we think about this? How useful is it? I’m honestly not sure. LibDem Equalities Minister Lynne Featherstone’s office was picketed last December by student protesters dressed in the WSPU’s signature colours of green, white and purple. 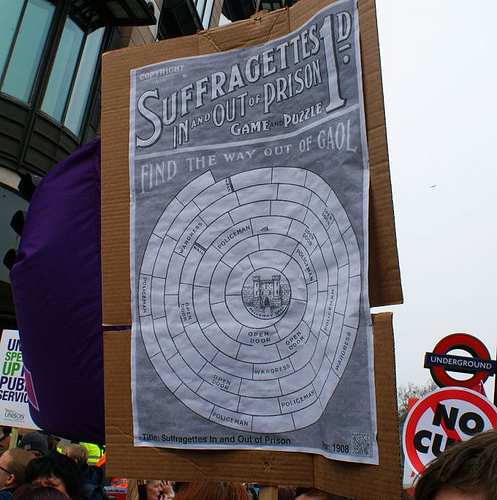 Whilst on the 26th March 2011 landmark anti-cuts demonstration spearheaded by GoingToWork, I spotted replica pieces of suffragette propaganda being carried down Whitehall. Meanwhile, feminist climate change pressure group Climate Rush have resurrected the entire apparatus of Edwardian propaganda aesthetics. Their promotional material, which is replete with obvious references to the imagery of the suffrage movement – big hats, button boots and sashes – that dominates the public consciousness, uses slogans such as “In the Name of the Suffragette”. I doubt this would faze the WSPU leadership, who were adept self-mythologisers even in their time. They knew they were making history, and the Pankhursts particularly were anxious to dispense with self-effacement in the face of what they saw as the pressing need for deeds over words. I admit I’m not sure what I think of the Rush’s implied assertion that the WSPU’s goals, aside from their slogans, would necessarily marry up with those of climate change activists in 2011 (Emmeline Pankhurst did, after all, stand as a Tory candidate, when all was said and done, and the upper echelons of the WSPU did little to help working class women such as Dora Thewlis). Perhaps the most interesting of these modern takes on early 20th century protest propaganda is Climate Rush activist and artist Cordelia Cembrowicz’s lithographs which feature a more diverse range of women than the many iterations of Rosie. I do wonder what will be on our posters next. Are we done yet, in these trying times of savage cuts that themselves remind of past eras, with suffrage and sainthood, with rivets and rolled curls? Should we be? I’m not sure. I’ll be on some of the demos, finding out. category → History Is Awesome, Revolting Women! Looked for an online vendor of the poster, no joy. Most likely a prop for this one episode. “Speak truth to power” is a phrase coined by a rather different religious sect, but it works well in this context.